Installing bifold doors is fairly easy, as long as the opening is the right size for them. When you are taking out an old set of bifolds it is not too much of a problem. Replacing bifolds in an opening that had another style of door may be an issue. See the article 'Bifold Door Sizes' for more information. Homes built in the last three or four decades are likely to have bifold doors installed in them. Bifold doors are inexpensive and easy to install making them popular with builders. You may have several bifold doors in your home. With repeated use the doors can get out of alignment and hardware can wear out. Assuming that you have openings that are the right size, you can install an new bifold door in an afternoon. Check out the rest of the information in this series to see if this is something you want to tackle. New doors range in price from about $50 to $150. Hiring someone to install if for you could run $75 to $175, or more. Since we are talking about replacing the bifold door, the savings is in the installation and the mark up on the material. Installing a bifold door is not that hard. With a little patience you can deal with most or all of the possible issues. Are you sure you need to replace the door? Adjusting and lubricating may get the door working properly again. See the article 'Repairing Bifold Doors' for more information. The biggest potential problem is the door not fitting in the opening. Both height and width will be a considerations. See the article 'Bifold Door Sizes' to see if you are a candidate for a new bifold. You will want to get most of the items out of the closet before you begin. Setting the doors involves tipping the panels. Before purchasing a bifold door, you want to do is verify the size you need. Both width and height matter when it comes to a bifold door. You won't get very far with your installing bifold doors project if the door won't fit. Take a look at the article 'Bifold Door Sizes', for information on correctly sizing your door. Does it look like a bifold door will fit? Good, you can move forward to actually purchasing the bifold door. There are a lot of options when it comes to purchasing a bifold door. Flush doors, embossed doors, louvered doors, unfinished and pre-finished are just a few of the things you want to consider. Likely, you will want to match the doors you already have in your home. Matching pre-finished doors may be a little challenging. You may not be able to find every size, style and finish in stock. Depending on your needs, you may need to order your door. Doors that are unfinished or primed should be finished before you install them. It is a lot easier to paint or stain a door on a bench. You start installing bifold door track by laying it out in the opening. The track and the bottom bracket determine the levelness of the door in the opening. Take a look at the instructions and verify the alignment of the tracks and the bottom brackets. If you took a bifold door out of the opening, the alignment should be the same. Begin installing bifold door track at the top using screws that are long enough to go through the drywall and into the wood framing. Install the brackets at the base in a similar way. 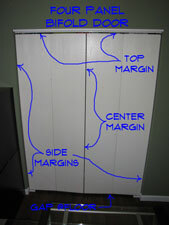 For a door that only has two door panels, you will have a choice on which way you want the door to open. The two door leaves can fold open on either the right or left side. It is up to you, it makes no difference to the doors. The bottom bracket needs to be installed on the side the you want the doors to open to. Make sure the bottom bracket is the same distance in from the face of the door opening as the top track. Each pair of bifold doors has three points of contact. Two at the top track and one at the bottom bracket. Proper alignment of these elements is important. In this step you can begin installing the bifold door hardware. There is usually a bag full of parts that comes with the door. It can be a little intimidating. Take a breath and open the bag to start identifying the parts. 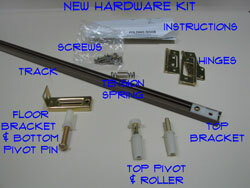 Before you begin installing bifold door hardware, you want to check the pieces that came with the door you purchased. 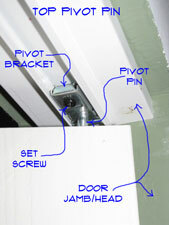 You should have a top pivot pin, bottom pivot pin and top guide roller for each pair of doors. The top and bottom pivot pins should go at the top and bottom of the same door slab. The top guide roller should go at the top of the other leaf. The doors should already have the hinges installed. Each pair of door slabs should be held together by two or three hinges. Before you install the hardware get the door opened up and laid, facing up, across two saw horses. Make sure you understand which end is the top. The pins and rollers should friction fit into the pre-drilled holes. Gently tap the pins into place with a hammer. Drive them in until they are snug. Unscrew the bottom pivot pin until there is about a quarter of an inch of threads showing. You may need to adjust this pin later, but this will be a good place to start. Setting the bifold door panels is similar to removing the old ones. It is a littly bit of work and you might want to get a little help. Likely they will only weigh thirty or forty pounds per pair. If you tipped the old ones out, you are already a veteran. When you have all the hardware installed you are ready to begin setting the bifold door panels. Fold the door leaves together and pick them up from the side. You tip the door into place in a similar way to removing it. Use caution when you tip the door in, the bottom pivot pin can damage the floor if it scrapes across it. It will be helpful to have a helper to guide the pins into place. The top guide pin has to hit a small hole in a bracket that is at the end of the top track. The roller just has to be inside the track. When the pivot pin and roller are in the top track, you can lift the door and set the bottom pivot pin into the bracket. Has your installing bifold doors project turned out to be a success? Hopefully it has. Part of the appeal of bifold doors is the fact that they are so easy to install. With practice, installing bifold doors can take less than an hour. Adjusting them, well that's another matter. They seem to move in so many directions. After you get used to them, adjusting is not hard either. A few well placed tweaks and the doors will work great. You may not be ready to start installing bifold doors for a living, but you may be willing to tackle another installation should the need arise.